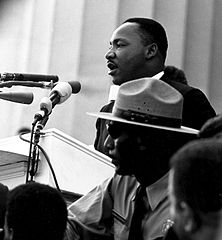 This sermon, delivered February 4, 1968 at the Ebenezer Baptist Church by Martin Luther King, Jr. is now controversial. Before the 2018 Super Bowl, it was only remembered by those studying speeches and the Civil Rights Movement. However, a copious quote served as the audio for a Dodge Ram Trucks commercial. See the commercial and read more on the controversy. As he often did, King spoke to his congregation about the issues of the day as understood through the Bible. He uses the metaphor of a drum major throughout. He finishes with a clear Christian message above anything of current events, but making sure his audience knows by implication that this means getting involved with the Civil Rights Movement and toward justice in general.